-Domain Name (optional but recommended) – This is an alias, or name, for your IP address. Think of it as a “speed dial name” on your phone. -256bit SSL Certificate (optional but recommended) – This will allow you to use https to access your HoudiniEsq instance more securely. This article will explain what these items are, and how you can obtain and set them up. IMPORTANT: We cannot provide direct support for the setup and maintenance of these items, as they are related to your network and not directly to HoudiniEsq. First, you will need to set up a Static IP Address from your ISP. This address will be applied to your routing device (typically your broadband modem) and serves as a permanent point to which you can access your network from outside your office. 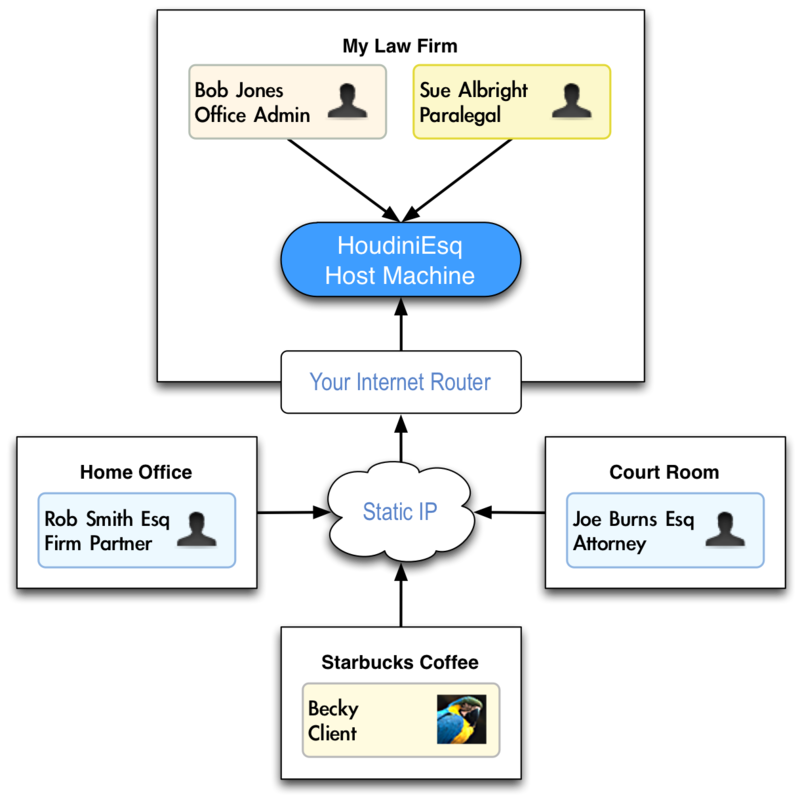 You can think of an IP Address as a phone number computers will use to talk to your instance of HoudiniEsq. The static IP address can be purchased from your Internet provider for a small additional fee, and they will typically provide instructions on how to set it up. They may even be able to configure it for you. Next, you will need to set up Port Forwarding on your routing device. This will allow your router to send incoming requests on a specific port (typically 80) to a selected computer on your internal network (your HoudiniEsq server in this case). This will allow external PCs and devices to connect to HoudiniEsq when they connect to your static IP, as shown below. Once you have a static IP address set up properly with Port Forwarding, you should be able to access HoudiniEsq from outside your network. If you still cannot do so, you may want to ensure that access to the instance is not being blocked by Windows Firewall or other security software. Next, you can opt to purchase a Domain Name from a registrar, such as GoDaddy. A Domain Name is just a friendly alias name for the Static IP Address, so you don’t have to remember it when attempting to connect. A domain also makes it easier to share with others. Typically, the registrar will provide instructions on how to set up this domain name to point to your Static IP address we set up in the previous step. Most providers will have a web-based interface for easy setup. HoudiniEsq can also be accessed remotely through a variety of other methods. If you currently have a VPN (curial private network) connection to your office set up, HoudiniESQ can be accessed while connected to it as you would any normal intra-office network resource. Simply open your web browser while connected, and log in as you normally would. Remote desktop software, such as LogMeIn or TeamViewer, can also allow you to access your instance from outside your office network in a pinch. However, while these methods are extremely easy to set up and utilize, they will create additional latency and can be extremely unreliable in terms of connection quality. We recommend them as a last resort.